How do I Find Pipefitter Employment? Pipefitters, or steamfitters, are responsible for installing piping systems. During an apprenticeship, pipefitters learn how to read blueprints, fabricate pipes, and more. 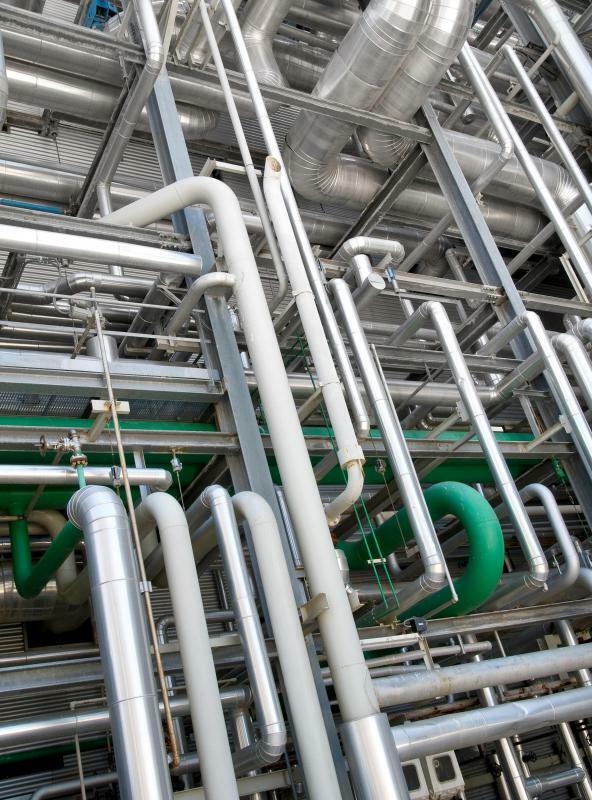 Pipefitters build, install, and maintain piping systems, usually for manufacturing plants, large office buildings, warehouses, hospitals, and schools. The job requires extensive skills in blueprint reading, welding, fabricating, and many other tasks related to plumbing work. In order to gain steady pipefitter employment, an individual is usually required to complete a four to five year formal apprenticeship and pass a journeyworker licensing examination. An experienced person looking for pipefitter employment can browse online and newspaper listings, inquire about positions with local unions and employers, and prepare a detailed resume to increase his or chances of landing a job. Many people who want to attain pipefitter employment pursue training programs at community colleges or vocational schools to help them prepare for apprenticeships. Most vocational programs last between six months and two years, and provide both classroom and hands-on instruction on the various techniques, tools, terminology, and laws involved in pipefitting work. Some programs are closely associated with pipefitter unions and local employers, and graduates typically have a better opportunity of finding apprenticeships than individuals with no vocational training. Apprenticeships are usually sponsored by local union chapters, though many large manufacturing plants, utility companies, and heating, ventilation, and air conditioning (HVAC) firms sponsor apprenticeship programs that are designed to prepare workers for industry-specific work. A formal apprenticeship program typically takes about four to five years to complete, and consists of classroom work as well as paid, on-the-job training with experienced pipefitters. In classes, new workers are given detailed instruction about the pipefitting business. They learn how to read blueprints, take measurements, calculate volume and pressure, and master the electronic equipment used to monitor pipe systems. On-the-job training usually involves assisting other workers, performing light welding, soldering, and fabricating work, and installing simple pieces. The length and intensity of apprenticeship programs vary by state, country, and even between employers. Many regions require apprentices to pass licensing exams after the completion of their training to earn journeyworker credentials. Individuals frequently seek additional, certification in a specialty, such as HVAC installation and repair, to improve their resumes and better their chances of finding pipefitter employment. Apprentices who learn the job through an employer are often offered permanent positions following the training period, though people who do not obtain immediate pipefitter employment must actively pursue job openings. Online job searches and newspaper classified advertisements are good sources to research employment opportunities. Some openings may not be expressly advertised, so it may be beneficial to contact union representatives and local manufacturing plants to ask about opportunities. An individual whose resume includes journeyworker certification, vocational school experience, apprenticeship training, and strong references usually has the best chances of finding reliable, well-paying pipefitter employment. What Does an Apprentice Welder Do? How do I Choose the Best Local Plumbers and Pipefitters?